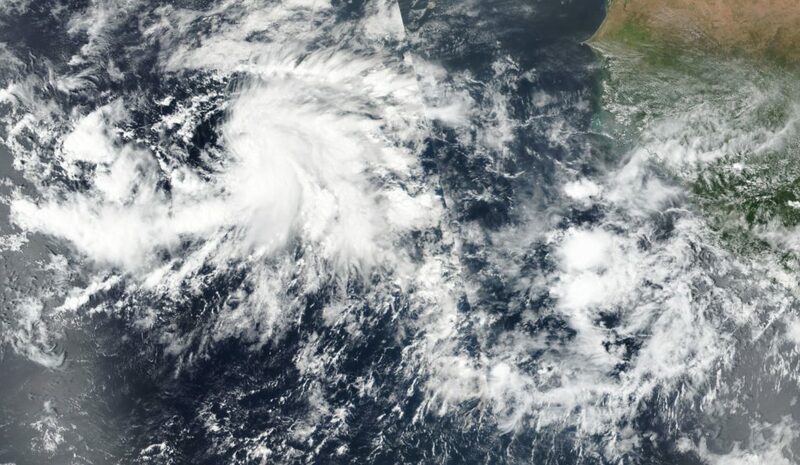 As Hurricane Michael barrels toward the U.S. states along the northwestern Gulf of Mexico, and Tropical Storm Leslie lingers in the Central Atlantic, Tropical Storm Nadine has formed off the west coast of Africa in the far eastern Atlantic. 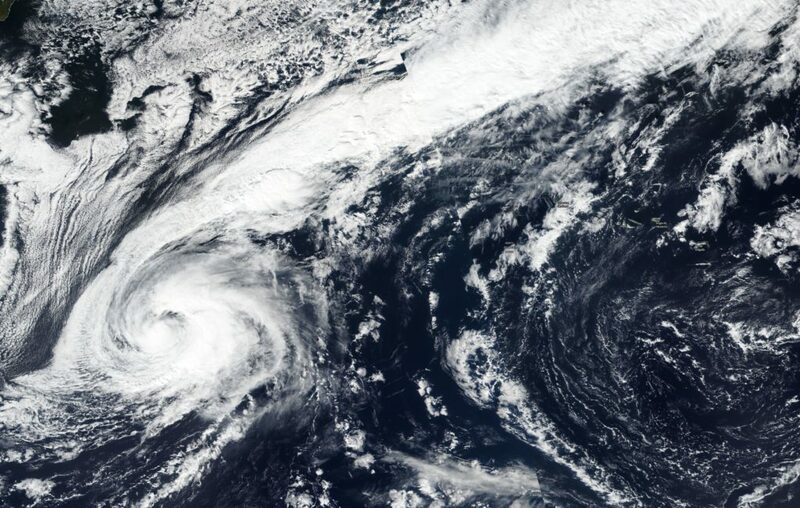 NASA-NOAA’s Suomi NPP satellite provided a visible image of the new named storm. 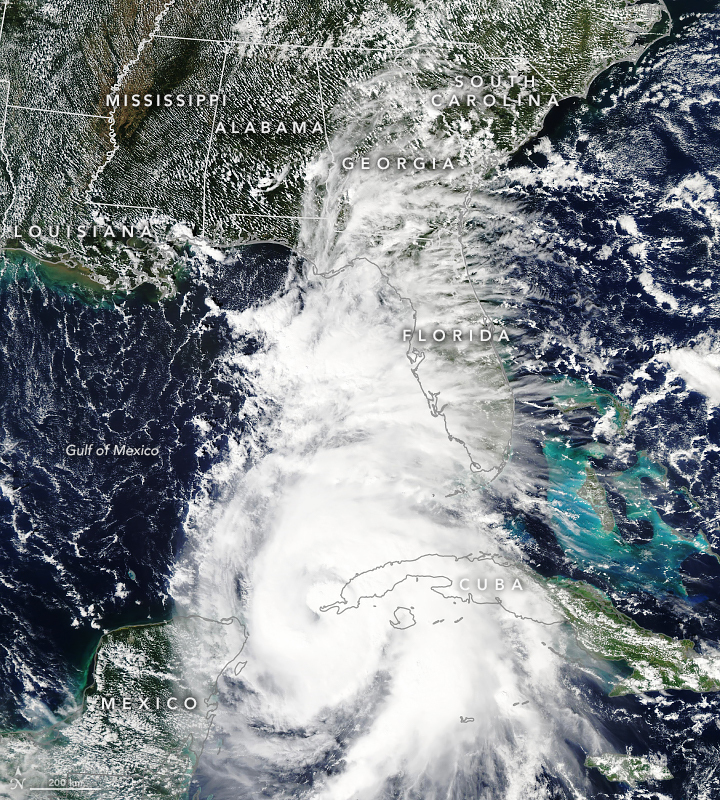 On Oct. 9, the VIIRS instrument aboard NASA-NOAA’s Suomi satellite provided a visible look at Tropical Storm Nadine. The bulk of storms were east to south of center and wrapping into the low-level center. NOAA’s National Hurricane Center noted st 11 a.m. EDT (1500 UTC) on Oct. 9 the center of Tropical Storm Nadine was located near latitude 10.5 North, longitude 30.0 West. That’s about 480 miles (770 km) southwest of the southernmost Cabo Verde Islands. Nadine is moving toward the west-northwest near 9 mph (15 kph), and this motion is expected to continue through tonight. A motion toward the northwest at a similar forward speed is forecast on Wednesday, Oct. 10 through Friday, Oct. 12. Maximum sustained winds have increased to near 40 mph (65 kph) with higher gusts. The National Hurricane Center noted that additional strengthening is forecast through Wednesday, with weakening expected to begin by early Thursday. Nadine is forecast to weaken to a tropical depression on Friday. 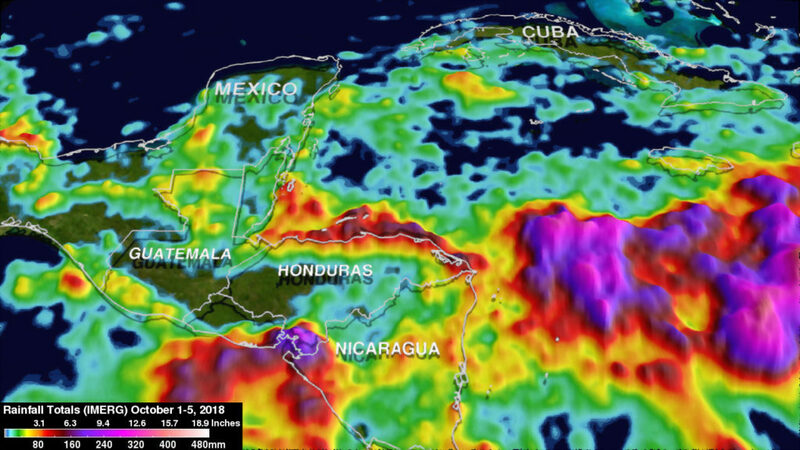 NASA’s Aqua satellite analyzed Tropical Cyclone Luban with infrared light to determine if the storm was intensifying or weakening. Luban formed on Oct. 8 in the Arabian Sea, Northern Indian Ocean and threatens Oman. 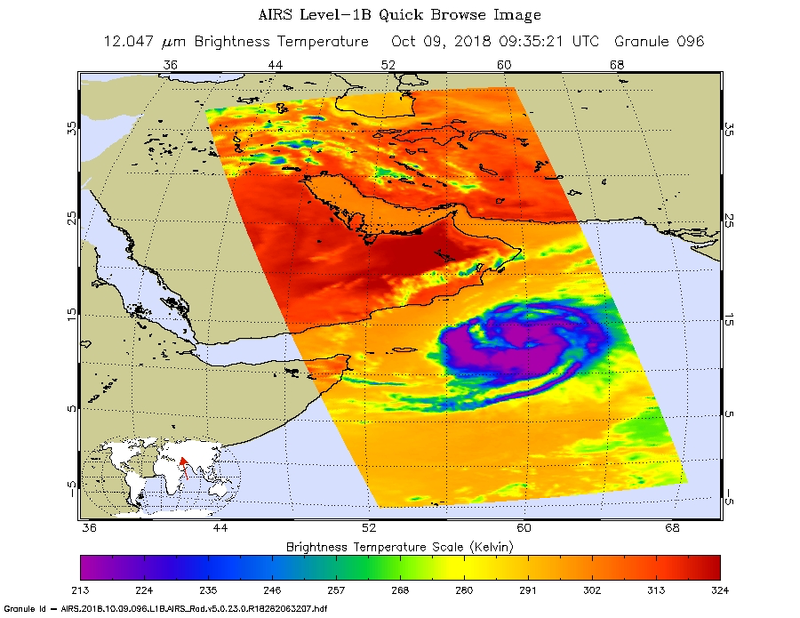 The Atmospheric Infrared Sounder or AIRS instrument aboard NASA’s Aqua satellite passed over Luban on Oct. 9 at 5:35 a.m. EDT (0935 UTC). AIRS uses infrared light and infrared light provides scientists with temperature data and that’s important when trying to understand how strong storms can be. The higher the cloud tops, the colder and the stronger they are. So infrared light as that gathered by the AIRS instrument can identify the strongest areas of a tropical cyclone. 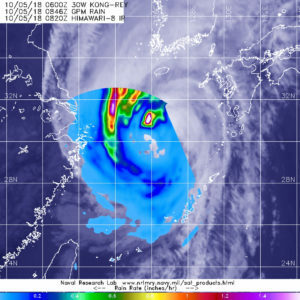 At 5 a.m. EDT (0900 UTC), the center of Luban was located near latitude 13.2 degrees north and longitude 60.1 degrees east. That’s 416 nautical miles east-southeast of Salalah, Oman. Luban is moving toward the west-northwest. Maximum sustained winds were near 55 knots (63 mph/102 kph). Luban is forecast to intensify to 65 knots (74 mph) and make hurricane strength as it moves west-northwest and later west. 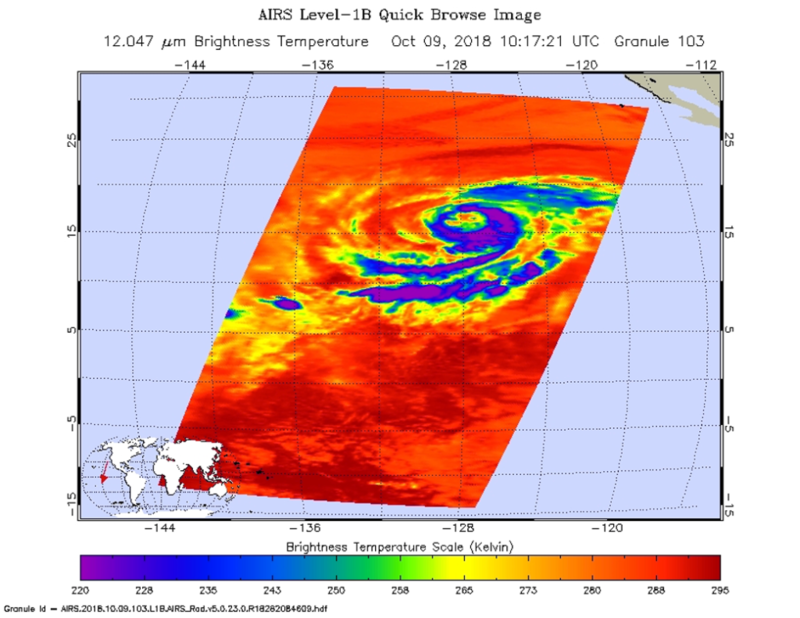 NASA’s Aqua satellite peered into Hurricane Sergio with infrared light to determine if the storm was intensifying or weakening. Infrared data showed cloud top temperatures were getting warmer on the western half of the storm, indicating the uplift of air in storms had weakened. 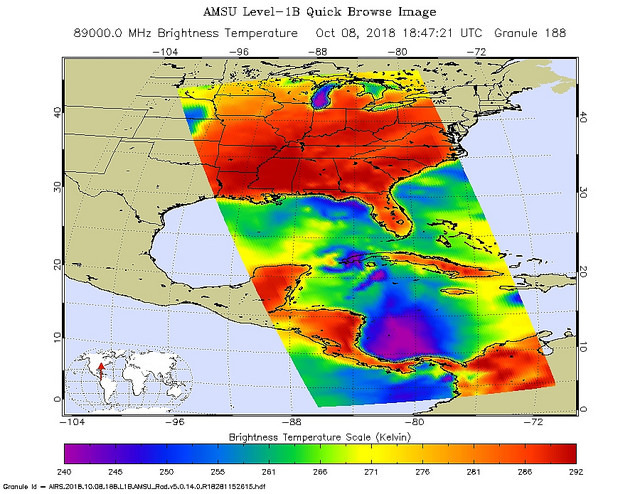 The Atmospheric Infrared Sounder or AIRS instrument aboard NASA’s Aqua satellite passed over Hurricane Sergio on Oct. 9 at 6:17 a.m. EDT (1017 UTC). AIRS uses infrared light and infrared light provides scientists with temperature data and that’s important when trying to understand how strong storms can be. The higher the cloud tops, the colder and the stronger they are. So infrared light as that gathered by the AIRS instrument can identify the strongest areas of a tropical cyclone. At the time Aqua passed overhead, coldest cloud top temperatures in thunderstorms circled the eye and appeared in fragmented bands of thunderstorms north and south of the center. Those temperatures were as cold as or colder than minus 63 degrees Fahrenheit (minus 53 degrees Celsius). The exception was on the western side of the storm, where cloud top temperatures were warming, meaning they were not getting as high in the atmosphere. Despite the slow weakening the hurricane still has a large but well-defined inner-core in the low and mid-levels. 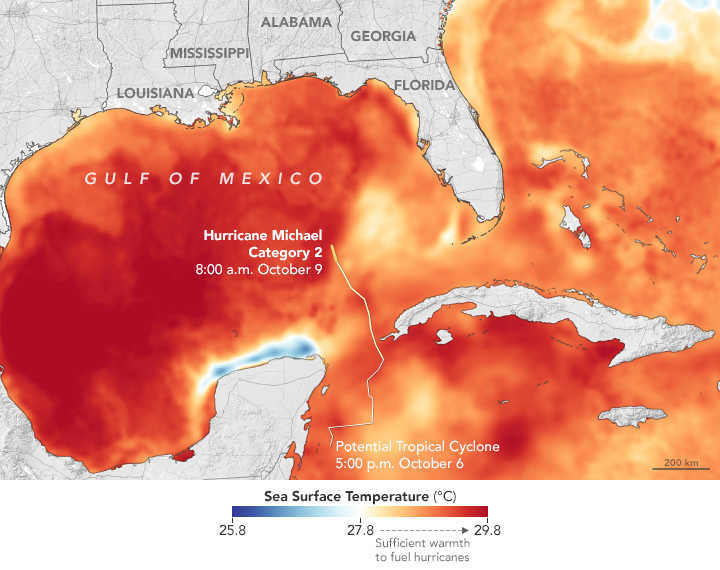 The National Hurricane Center noted at 11 a.m. EDT (1500 UTC), the center of Hurricane Sergio was located near latitude 16.6 degrees north and longitude 127.4 degrees west. That’s 1,215 miles (1,960 km) west-southwest of the southern tip of Baja California, Mexico. Sergio is moving toward the northeast near 7 mph (11 kph). A faster northeastward motion is expected for the next several days. Maximum sustained winds have decreased to near 80 mph (130 kph) with higher gusts. Gradual weakening is anticipated during the next several days. NHC noted that there are no coastal watches or warnings in effect, but interests in Baja California Sur should monitor the progress of Sergio. On Oct. 8, the VIIRS instrument aboard NASA-NOAA’s Suomi satellite provided a visible look at Tropical Storm Leslie that showed a developing eye and a long stretch of clouds associated with an elongated area of low pressure that extends over the United Kingdom. 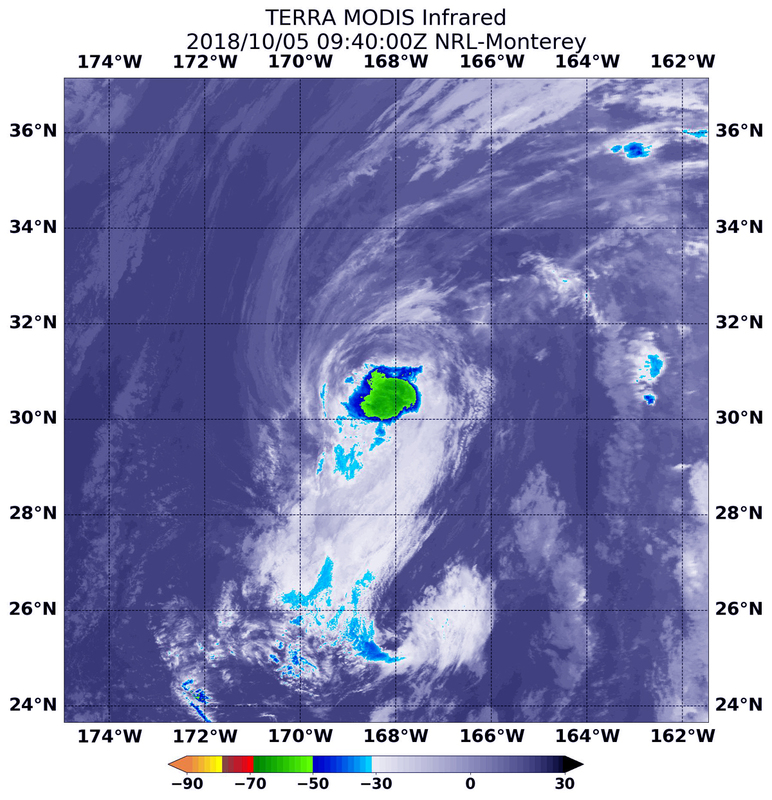 At 11 a.m. EDT (1500 UTC) on Oct. 9 the center of Tropical Storm Leslie was located near latitude 31.3 degrees north and longitude 43.5 degrees west. That’s 1,045 miles (1,680 km) west-southwest of the Azores Islands. Leslie is moving toward the south-southeast near 13 mph (20 kph), and this general motion is expected to continue for the next day or so. Maximum sustained winds are near 65 mph (100 kph) with higher gusts. Some strengthening is anticipated, and Leslie is forecast to become a hurricane again on Wednesday. Hurricane Sergio continued to look impressive on satellite imagery when NOAA’s GOES-West satellite viewed the storm in infrared light. NOAA’s GOES-West satellite sits at a fixed position in orbit and covers the western U.S. and the Eastern and Central Pacific Ocean. GOES satellites circle the Earth in a geosynchronous orbit, which means they orbit the equatorial plane of the Earth at a speed matching the Earth’s rotation. This allows them to hover continuously over one position on the surface. NOAA’s GOES-West satellite provided a night-time view of powerful Hurricane Sergio on Oct. 5 at 6:01 a.m. PDT (9:01 a.m. EDT/1301 UTC) in the Eastern Pacific Ocean. 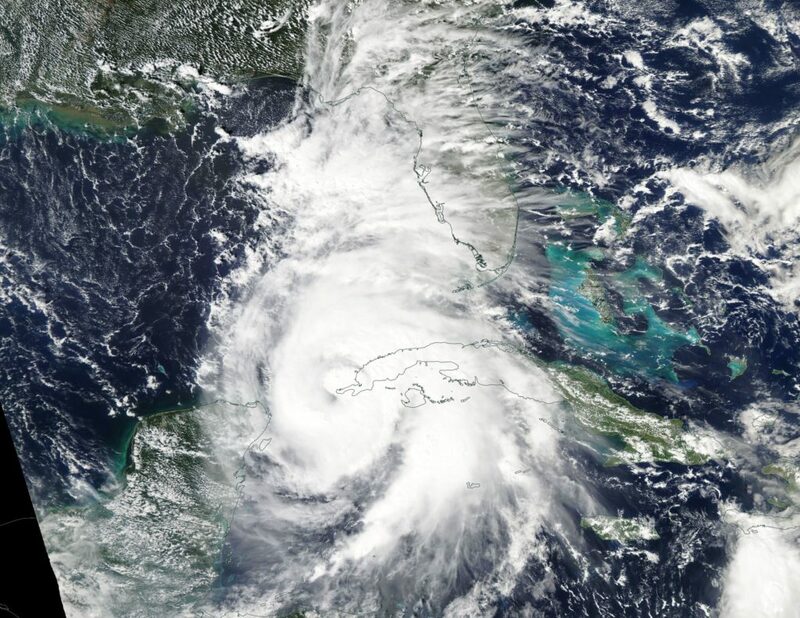 The imagery showed that Sergio had a clear eye with powerful thunderstorms circling the center. 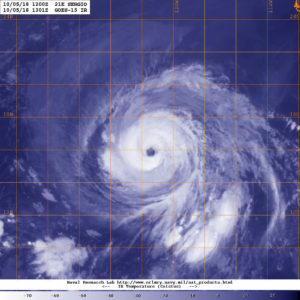 At 2 a.m. PDT (5 a.m. EDT/0900 UTC), the eye of Hurricane Sergio was located near latitude 16.0 degrees north and longitude 121.2 degrees west. Sergio is moving toward the west-northwest near 8 mph (13 kph). A turn toward the west and west-southwest at a similar speed is expected during the next 24 hours. Sergio should then turn back to the west and northwest over the weekend. Maximum sustained winds have decreased to near 120 mph (195 kph) with higher gusts. Sergio is a category 3 hurricane on the Saffir-Simpson Hurricane Wind Scale. Additional gradual weakening is forecast during the next several days, but Sergio is expected to remain a hurricane through the middle of next week. NOAA manages the GOES series of satellites and the NASA/NOAA GOES Project at NASA’s Goddard Space Flight Center in Greenbelt, Maryland, is responsible for building and launching the GOES satellites.